I had the pleasure to use a “Bookeye” book scanner. It’s a huge device which helps scanning things like books or folders. It’s very quick and very easy to use. I got a huge PDF out of my good 100 pages that I’ve scanned. Unfortunately the light was very bright and so the scanner scanned “through” the open pages revealing the back sides of the pages. That’s not very cool and I couldn’t really dim the light or put a sheet between the Pages. Also, it doesn’t do OCR but my main point of digitalising this book was to actually have it searchable and copy&pastable. Apparently this is supposed to be tesseract on steroids as it can recognise text on paper and different layouts and everything. Since it’s a bit painful to compile, I’d love to share my experiences hoping that it will become useful to somebody. During compilation of ocropus, you might run into issues like this or that, so be prepared to patch the code. usage: ./ocropus-install/bin/ocroscript [options] [script [args]]. However, I can’t do anything because I can’t make LUA load the scripts from the share/ directory of the prefix. Too sad. It looked very promising. This is an interesting thing. It’s a BSD licensed russian OCR software that was once one the leading tools to do OCR. Interestingly, it’s the most straight forward thing to install, compared to the other things listed here. This is supposed to produce some sort of HTML which we can glue to a PDF with the following tool. Apparently takes “HTML annotated OCR data” and bundles that, together with the image, to a PDF. Adding “LDFLAGS += -lgif” to the Makefile fixes that. I couldn’t find a bug tracker, hence I reported this issue via email but haven’t heard back yet. as a full suite it can import pictures or PDFs and use a OCR program mentioned above (tesseract or gocr). The whole thing can then be saved as a PDF again. Results with gocr are not so good. I can’t really copy and paste stuff. Searching does kinda work though. tesseract: unicharset.cpp:76: const UNICHAR_ID UNICHARSET::unichar_to_id(const char*, int) const: Assertion `ids.contains(unichar_repr, length)' failed. ***  ignoring at /usr/bin/gscan2pdf line 12513. This is actually an appliance and you can download an ISO image. Funnily enough, the image won’t boot with more than 786MB of RAM. Quite weird, but qemu just reports the CPU to be halted after a while. If it does work, it boots up a firefox with a nice WebUI which seems to be quite functional. However, I can’t upload my >100MB PDF probably because it’s a web based thing and either the server rejects big uploads or the CGI just times out or a mixture of both. But unsquashfs helped to extract the whole thing onto my disk. They used “T2” to bundle everything to a CD and packaged software mentioned above. Unfortunately, very old versions were used, i.e. cuneiform is in version 0.4.0 as opposed to 1.0.0. Hence, I don’t really consider it to be very useful to poke around that thing. It’s a huge thing worth exploring though. It all seems to come from this SVN repository: svn://svn.archivista.ch/home/data/archivista/svn. For some reason, they built an ISO image as well. Probably to run an appliance. The image booted up a webbrowser which showed a webinterface to the WebOCR functionality. I extraced the necessary scripts which wraps tools like cuniform, ghostscript and friends. Compared to the archivista box, the scripts here are rather simple. Please find webocr and img2pdf. They also use an old cuneiform 0.8.0 which is older than the version from Launchpad. 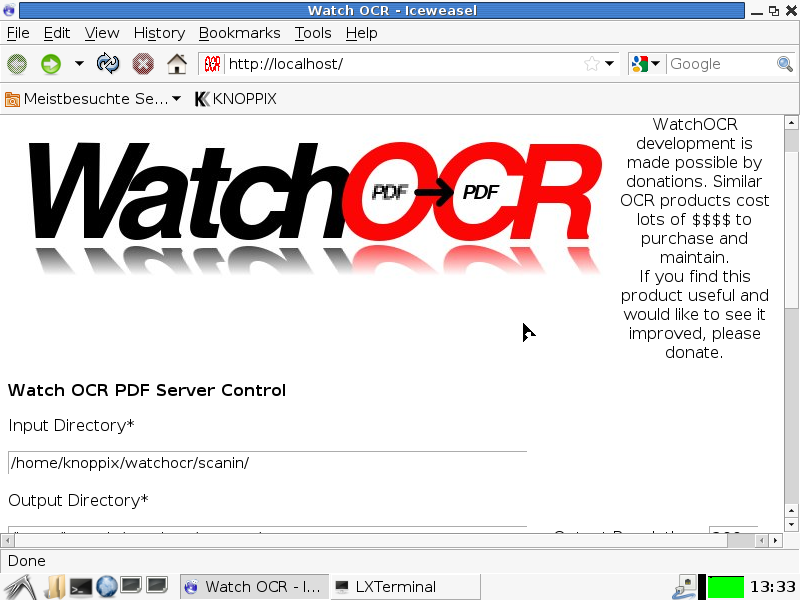 However, in my QEMU instance, the watchocr box took a very long time to process my good 100 pages PDF. That tries to do the job did in fact quite well, although it’s quite slow as well. It lacks proper support for spawning multiple commands in parallel. pdfjam: This is pdfjam version 2.08. Having overcome that problem, the following pdfjoin doesn’t work for an unknown reason. After having replaced pdfjoin manually, I realised, that the script sampled the pages down, made them monochrome and rotated them! Hence, no OCR was possible and the final PDF was totally unusable *sigh*. I still don’t have a properly OCRd version of my scanned book, because of not very well integrated tools. I believe that programs like pdftk, imagemagick, unpaper, cuneiform, hocr2pdf, pdfjam do their job very well. But it appears that they are not very well knit together to form a useful tools to OCR a given PDF. Requirements would be, for example, that there is no loss of quality of the scanned images, that the number of programs to be called is reduced to a minimum and that everything needs to be able to do batch processing. So far, I couldn’t find anything that fulfills that requirements. If you know anything or have a few moments to bundle the necessary tools together, please tell me :o) The necessary pieces are all there, as far as I can see. It just needs someone to integrate everything nicely.